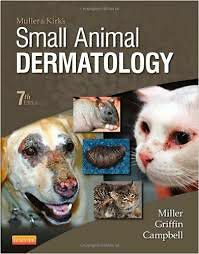 Covering the diagnosis and treatment of hundreds of dermatologic conditions, Muller and Kirk's Small Animal Dermatology, 7th Edition is todays leading reference on dermatology for dogs, cats, and pocket pets. Topics include clinical signs, etiology, and pathogenesis of dermatologic conditions including fungal, parasitic, metabolic, nutritional, environmental, and psychogenic. This edition includes full updates of all 21 chapters, and more than 1,300 full-color clinical, microscopic, and histopathologic images. Written by veterinary experts William Miller, Craig Griffin, and Karen Campbell, this resource helps students and clinicians distinguish clinical characteristics and variations of normal and abnormal facilitating accurate diagnosis and effective therapy.